I have just returned from a four day border walk in Taman Negara with MyCat. Some of the other participants I’d been trekking with before, but there were a few newcomers as well who, as is almost always the case, had the heaviest rucksacks. 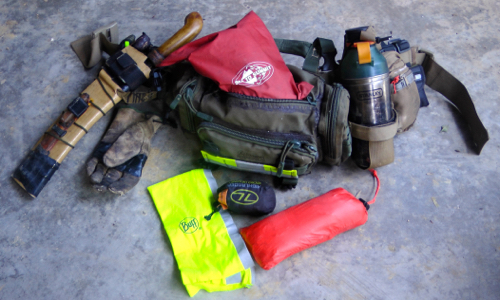 I was exactly the same when I first started trekking and I think it is natural evolution that our bags get lighter as we refine our kit and leave behind stuff that we can do without. Anyway, I thought it would be useful for me to list out all the items I take in with me, firstly because then I have a list to refer to for the next trip and secondly because it might help newcomers to jungle trekking to lighten their own load. One particular item that can really weigh down your rucksack is, of course, water. A useful tip is to drink a litre or more of water just before leaving camp (rather than carrying it along). Another thing to bear in mind is where you are going – if you are following a river then there isn’t the need to carry more than a litre of water as you can fill up as you go along, whereas if you’re up on a ridge then you might need to carry 4 litres of water. The point is you shouldn’t be carrying the same amount of water throughout the trip but rather gauge how much you need depending on where you’re going. I take in the onions and chillies fresh which, although it means a bit of extra weight, the taste is worth it for me. The problem with vegetables is that they sweat in plastic bags and tend to rot quickly and a good tip is to wrap them up in newspaper before putting them in a bag which will help keep them dry and fresh. Small plastic bottle of olive oil. With my pack fully loaded (but excluding water and food) the weight comes in at 7.8KG. Planned Obsolescence: The absurd practice of designing products with a limited lifespan in order to maximise profits. Based on the notion that infinite economic growth can be balanced by the finite resources of the planet. My Macbook is dying and, while waiting for a replacement, I wanted to resurrect it for long enough to do this post and a video and explain why I’ve been slow getting back to people who’ve been kind enough to comment. Like many, I despair about the way new products seem to have obsolescence built in and the way manufacturers are making it harder and harder for their machines to be repaired or upgraded. For example I’m ordering a Mac Mini as a replacement, not because they are good (having dropped their four core processing ability) but because it’s the easiest/cheapest option. The RAM on the new Mac Mini is soldered onto the motherboard, so you are unable to increase it at a later date (or use cheaper third party RAM instead). Also new cables are needed as Apple seem to love changing these as often as they can get away with, forcing everyone to buy ridiculously expensive new adaptors etc. It’s all very aggravating. I might be able to reluctantly accept the fact that these companies are (cynically) trying to maximise profits, but what really annoys me is the waste of resources this approach involves. What are we meant to do with all those old computers and redundant cables? The same seems to be true of a lot of car designs these days and, whereas in the past, repairs could be done at home and various (if not all) parts of the car could be replaced…now it’s not so easy and there is nothing manufacturers like more than for you to throw away the old and buy the new model instead. By comparison my Land Rover is now 28 years old and going strong. I don’t see why a computer manufacturer can’t offer a sort of standard box to which RAM, processors, etc can be snapped into place, so that we only have to throw away/replace the part that is redundant and not throw ‘the baby out with the bathwater’. …or rather I do see why they do it and I don’t like it. I may have bought another Mac this time round but I feel increasing resentful about Apple’s treatment of its original customer base and when a good alternative turns up (and one day it will) I’ll switch….and I’ll never look back. Aloe Blacc (in the quote above) seems to have neglected to include water – which I suspect he would find he needed sooner than the other items listed, but nevertheless I get his point. 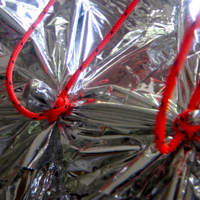 In this video I look at how to repair a tarp that’s been ripped in two and, to make life a little more challenging, I am using a mylar space blanket (which is my survival kit shelter item) rather than a normal every day use tarp. However, this method can be done with any sort of tarp or any cloth material you need to joint together. The method I’m using is also the way I attach the guy lines to the space blanket. As with shelter building in general, there is a balance between what materials you have available, how long you have to build your shelter and how effective you need it to be. In the case of a field repair of a tarp there is no point in relying on a method that requires materials you don’t normally carry, nor is it helpful to only know a method that takes so long that night (and/or rain!) falls before you’ve finished the repair. With that in mind the method I use is quick and requires nothing more than a stick, plastic bag, some thin cordage and a tiny bit of a knowledge (how to tie a constrictor knot on the bight). I thought it would be useful to talk about the weather and the effect the tropical climate has, particularly on those not acclimatised to it, for the simple reason that this is often the element of jungle trekking that newcomers find most difficult. However, once you know what to expect, you can both mentally adjust to the new environment and adjust your camp routine/gear/clothing accordingly. Perhaps the first step in adapting to this hot and humid environment is to understand your own limitations – it is more difficult to exert yourself physically here than it is in a cool dry climate and you need to make allowances. These can be as simple as conserving energy whenever possible, slowing your pace down slightly, carrying the lightest load you can get away with and, most importantly of all, not planning a trip that is too ambitious until you have at least tested yourself on a shorter/easier trip first. It also means that you allow for the heat and humidity and dress accordingly. I wear well worn, cotton clothes that are baggy and airy, wool socks and cycling shorts in place of underpants. The cycling shorts (usually the only synthetic clothing I use) are because cotton can rub against your skin when wet and cause soreness. Wool socks may seem a strange choice, but cotton will rub your feet sore when wet and synthetics will make you feet sweat (I even avoid the wool/synthetic mixes if I can). Synthetic ‘wicking’ type shirts are quickly overcome by the amount of sweating you’re doing and, combined with the overall humidity (which effectively stops the sweat from evaporating from your skin), you end up with a film of sweat between your skin and the shirt (and unpleasant and clammy feeling for me at least). All the sweating you’ll be doing also means you need to drink more and replenish mineral salts that you are losing. At the equator, the sun beats down brutally during cloudless days and the jungle trekker does well to stay in the shade of the forest….I would go out of my way to avoid a trek over open countryside in the middle of the day here if it meant I could stay in the shade of the forest. The equatorial location also has an impact on the way you camp as darkness falls quickly, rains usually come in the early evening and you will want to go to sleep early so that you can wake early and take advantage of the relative coolness of the mornings. A number of you have written in asking about my camping routine and that’s what I want to cover in this article and the video below. None of it is rocket science but hopefully there are some useful tips for those not used to camping in the jungle. In terms of priorities once a camp site has been chosen; usually the first thing I do is set up the hammock and tarp (although not necessarily removing the tarp from its snake skin), after that fire and water are the next two priorities: setting up a gravity fed water filtering system and collecting wood for a fire. If the insects are being pesky then getting a fire going takes priority simply because the smoke will drive them away (throw some green leaves on the fire once it’s going and that will produce lots of smoke) but usually fire and water are done simultaneously. I alway trys to get my food cooked and the dishes cleaned and put away before the light falls simply because it’s easier to do during daylight. And after that the hammock beckons and often by about 9pm I am away in the land of nod. Finally the other factor that often confuses the newcomer to the tropics is the weather, which can change quickly and dramatically and is very location specific. In the northern and southern hemispheres the weather forecasts are more reliable than they are at the equator and, although there may be defined rainy and dry seasons at the equator there can also be a lot of variation within these seasons (indeed within the same day!) and the weather can be completely different in two locations no more than a few miles apart. Of course the main weather factor that affects the jungle trekker is the rain (as temperatures remain fairly constant throughout the year) – the good news is that getting wet during the day in not something you need to worry about – just something you need to mentally get used to, accept and ignore – but staying warm and dry through the night is important. Rather than rely on long range forecasts (which are often wrong) I try to anticipate changes in the weather from the signs around me (the most obvious being cloud formations and thunder) as these usually give you an hour or so warning of an approaching storm.